Kale, Collards, Mustard, Dandelion, Chard, and Spinach. Say “hello” to the dark leafy greens family! Greens are amazing. I mean really AMAZING! Calorie for calorie they are one of the most nutrient packed foods on the planet. They contain magnesium which helps with hormone regulation and nutrient partitioning. They also contain phytonutrients (the GREEN color) which helps reduce oxidative damage in our cells from toxins, stress, and aging. Vitamin K is also a very EXCITING part of the nutritional content of greens. Vitamin K is fat-soluble, so make sure to eat your greens with a fat. Saute them in coconut oil, roll up some avocado… or eat them with bacon! 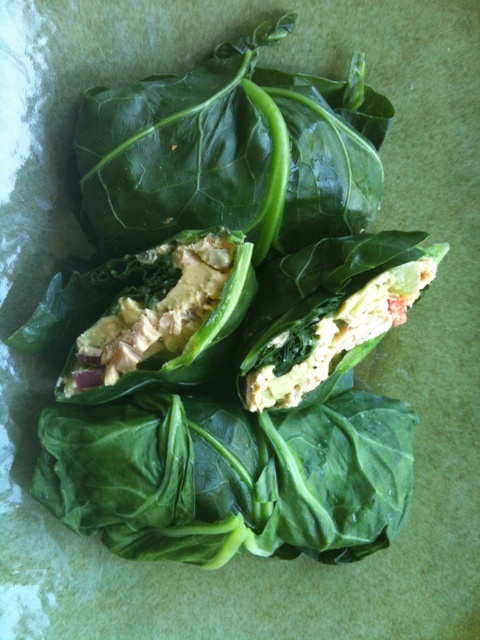 For the paleo folks who really miss having wraps, sandwiches, etc… greens are your new best friend. 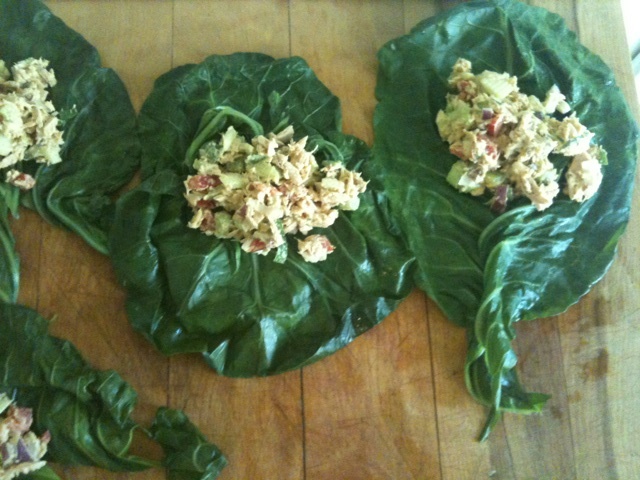 The large leaves of collard greens can be used as a wrap for just about anything. 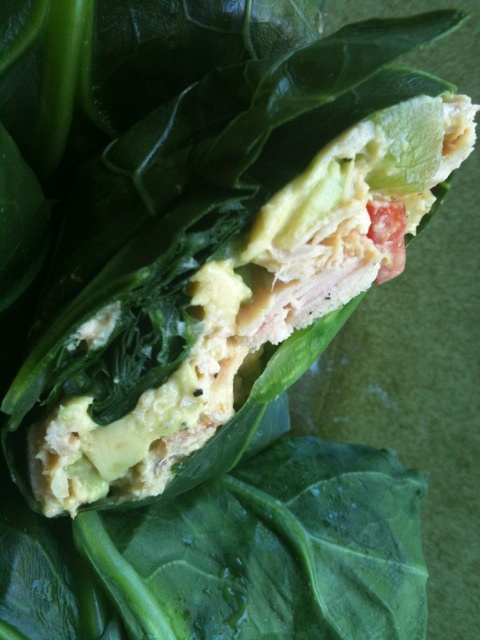 Here’s a little meal I made that incorporates some fat, protein, and you guessed it… GREENS! De-stem collard by running the knife along the leaf, close to the stem starting about halfway up the leaf. Heat about a half-inch of water in a large skillet, have the lid ready. Place collard leaves into the skillet and cover. Steam for a few minutes until pliable. Hang dry on a rack or immediately place in the fridge to cool down. In a large bowl, combine tuna, bacon and veggies. Add spices and evenly toss. Add oil, mustard, and lemon juice and mix together until evenly combined. 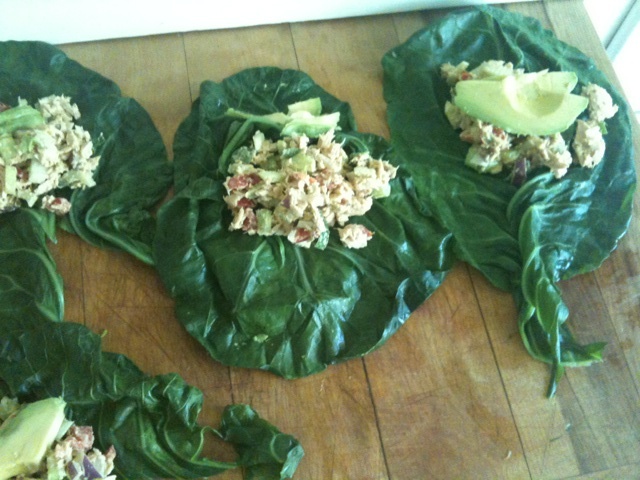 Take collard wrap onto a cutting board with the “stem” end facing you. Place a small amount of tuna mix in the middle above the cut line from where you removed the stem. Place a slice or two of avocado on the mix. 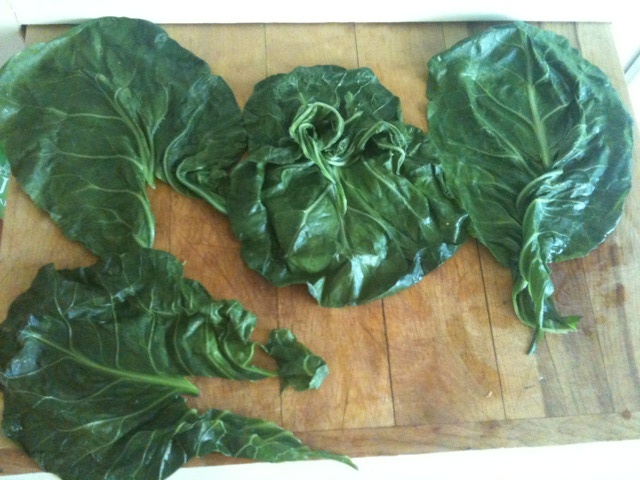 Take the bottom flaps of the collard leaf and lay them over the mixture tightly. From there, fold in the sides of the leaf and roll the whole thing up and over the top of the leaf, like you are rolling a burrito.